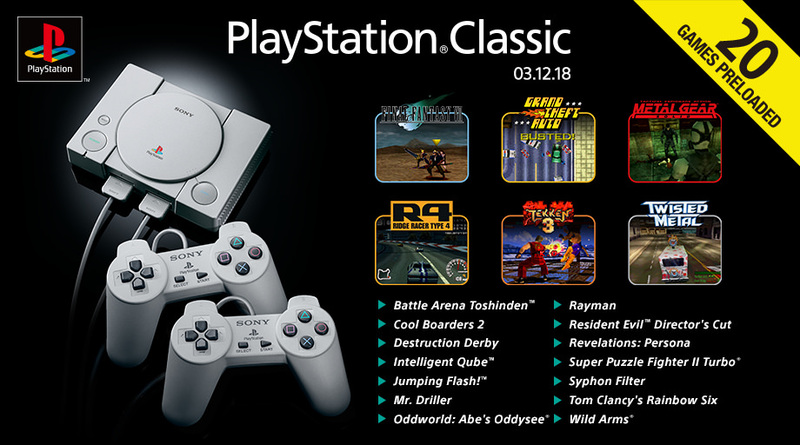 Enlarge / The European PlayStation Classic has the same game selection as the American one, but it’s the only one to get an official listing image today. Hence, the release date is listed up there as "03-12-2018," meaning, December 3. When the PlayStation Classic was announced in September, the mini-retro box had plenty of details confirmed, including a December 3 release date and a $ 99.99 price. But its full 20-game list was missing, which changes today with an unveiling of what will likely be the make-or-break factor for potential buyers. The list includes a few glaring omissions for PlayStation faithful. The biggest crater in the list is arguably thanks to publisher Activision, whose PlayStation-defining series Crash Bandicoot, Spyro the Dragon, and Tony Hawk’s Pro Skater all missed the cut. (Sony originally published Crash and Spyro games before those series’ rights were acquired by Activision.) EA is nowhere to be found, as well, though its roster of popular sports games would likely be a rights quagmire to bring back in a retro collection like this. Additionally, Sony has left two of the PlayStation’s defining racing series off the roster: WipEout and Gran Turismo (which each had two PS1 entries). Standing in their stead is Cool Boarders 2 (which is the only ’90s “extreme sports” game on offer; sorry, Jet Moto fans). And while Square Enix has shown up with the previously announced Final Fantasy VII, the publisher apparently didn’t cough up any of the best-selling original Tomb Raider games—or any of its other hugely popular ’90s RPGs. That’s different in Japan, where Squeenix RPGs Parasite Eve and SaGa Frontier will reach that nation’s version of the console. Japan’s PlayStation Classic will also ship with two Arc the Lad RPGs. As we pointed out in September, an FAQ at the console’s Japanese site claims there will be no official way to download updates to this console, so what you see is likely what you’ll get when the system launches in December. Whether it proves to be an easily exploitable (and thus dubiously expandable) living-room box, like its miniature NES and Super NES rivals, remains to be seen.